The Corporate and Securities Group provides strategic solutions to the complex legal and business issues facing clients while helping them achieve their business objectives. Clients range from entrepreneurs seeking counsel on selecting the correct business form and raising capital, to established companies looking to grow through acquisitions and form strategic alliances, to private equity firms requiring assistance in the acquisition or divestiture of portfolio companies. We advise clients on transactional, regulatory and compliance issues, as well as representation in litigation and enforcement matters, and provide advice to publicly traded companies and their boards of directors on Sarbanes-Oxley, Dodd-Frank and other corporate governance matters. Our experienced and multidisciplinary team is focused on providing practical, business-oriented advice in an efficient and cost-effective manner. We assist clients in selecting the proper legal entity in which to conduct business and draft the necessary documentation, including corporate formation documents, limited liability company operating agreements, limited partnership or general partnership agreements and shareholder agreements. We are adept in negotiating, drafting and reviewing agreements of all types, including employment, distribution, manufacturing and licensing across multiple industries. We assist clients with transactions that provide access to debt and equity capital through the sale of stock, partnership or limited liability company interests, or through the issuance of debt to institutional lenders. Our clients rely on us to provide strategic counsel in negotiations and to advise them with respect to reviewing, negotiating and closing commercial loan transactions. When our clients seek opportunities to expand, whether through partnership or strategic alliance or by making strategic acquisitions, we provide the legal guidance and draft and negotiate the necessary documentation to facilitate these transactions. We also assist our clients with understanding and complying with the myriad federal, state and local regulations that apply to their businesses. Although we are often the first point of contact for our clients, we draw on the experience of the lawyers in our varied practice groups to best serve our clients’ needs. We collaborate with members of the International, Labor and Employment, Tax and Estates, Bankruptcy and Creditors Rights, Real Estate, Finance, Intellectual Property, and Commercial Litigation groups to provide seamless solutions to our clients’ issues and help them achieve their business objectives. Whether it be a private equity company seeking to add a portfolio company or an operating business whose expansion plans require a specific acquisition, we assist in structuring, documenting, negotiating and closing asset or stock purchases and mergers. We help management or other sponsors in buy-out transactions, including structuring the acquisition terms and creating the debt and equity structure as needed, to successfully conclude these leveraged transactions. Clients seeking to expand resources turn to us for help in forming domestic, as well as international, commercial relationships, including joint ventures, partnerships and strategic alliances. We have extensive experience in the process of exiting investments for both the private equity investor seeking to monetize a portfolio company, to a closely held business whose ownership has decided that it is time to sell. We help structure, negotiate and close exit transactions in a manner to reduce or eliminate residual risk of entity ownership. When initial or additional operating capital is needed by our clients, we structure and document private placements, counsel our clients regarding their debt and equity financings, and assist them with their commercial loans, including negotiating favorable terms and conditions and advising on securities law compliance at the federal and state levels. We represent individual entrepreneurs and private equity funds in entity formation and ongoing governance issues. After listening to and critically evaluating our clients' business plans and short term and long term objectives, we work to develop the optimal legal structure for their business based on consideration of liability, tax and securities law issues. 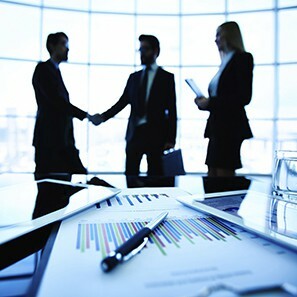 Whether the preferred structure is a corporation, limited liability company, limited partnership or general partnership, we craft the formation documents, operating agreements, shareholder agreements, partnership agreements or bylaws to suit the unique issues presented by our clients' business plans. We are particularly attuned to issues arising from minority interests in companies and have broad expertise in negotiating investor rights agreements from the perspective of both the company and the minority investor. We represent companies, officers and directors in a broad range of regulatory proceedings and litigation. We have substantial experience representing parties involved in individual and class actions brought by private litigants in SEC and FINRA investigations and enforcement proceedings, and in arbitration proceedings resulting from customer-broker and broker-broker disputes. These proceedings involve a wide range of subject matter, including market manipulation, securities fraud, RICO claims, registration issues and SRO compliance matters. Our litigation team has extensive experience handing the procedural and substantive issues arising out of large securities cases including defenses available under the Private Securities Litigation Reform Act, the Securities Litigation Uniform Standards Act and substantive defenses pertaining to loss causation and preemption. Our clients value cost-effective, partner-level attention on complex litigation matters such as these. Represented a data analytics company that provides proprietary consumer intelligence to major luxury brands in its sale to a global communications agency. Delaware Supreme Court Decision Highlights Interpretation of "Commercially Reasonable Efforts" and "Reasonable Best Efforts"
SEC Adopts Final Equity Crowdfunding Rules – Will They Be Worth the Wait? Chadbourne & Parke v. Troice: Will the Supreme Court's Narrow Statutory Interpretation Open a Wide Door to Securities Lawsuits? iNovia Capital Leads Series B Financing Round for Boosted, Inc.
Almo Professional A/V Acquires International Audio Visual Inc.